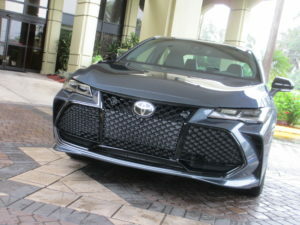 The roads of Avalon, the mystical paradise that inspired Toyota’s flagship nameplate, have likely never seen a mid-premium sedan like this. Safe to say, neither has San Diego. Until now. 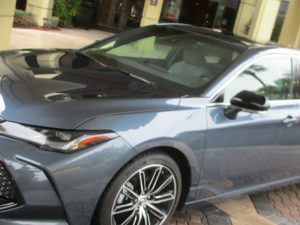 To its menu, Avalon mixes a bevy of Toyota-firsts such as standard Apple CarPlay and available Dynamic Auxiliary Turn Signals, available authentic Yamaha wood and aluminum cabin accents, and Engine Sound Enhancement. 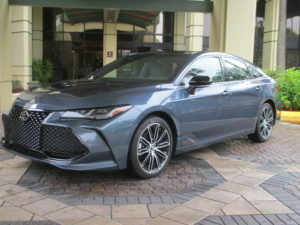 In addition, drivers will appreciate the standard passive and active safety benefits through Toyota Safety Sense P (TSS-P), as well as athletic handling thanks to its available Adaptive Variable Suspension (AVS), also a Toyota first, that, quite positively, has Avalon out-performing its peers. 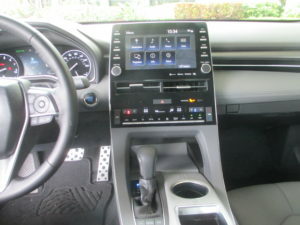 Soft-touch materials are noticeable throughout – around the flowing, low-profile center console decorated in piano black trim; on the slim, tiered instrument panel leading into the doors; in the rear compartment, where doors and console mirror the impressive craftsmanship seen in the front cockpit. 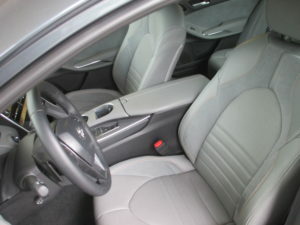 A rear cup and device holder, accented in piano black and satin chrome-finish, folds up and down in the armrest between passengers. 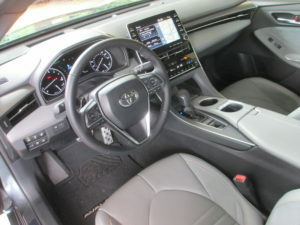 Ahead of their knees and within arm’s reach: air vents, controls for the available seat warmers, and essential USB charging ports. Deep curvatures in the doors’ armrests provide passengers with ample surface area and comfort during long commutes. 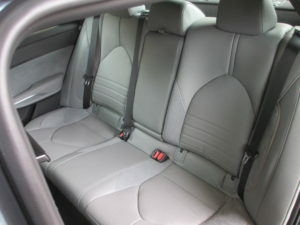 Rear seat roominess is exemplified by Avalon’s segment-best measurements in three categories: shoulder room (57.1 in. 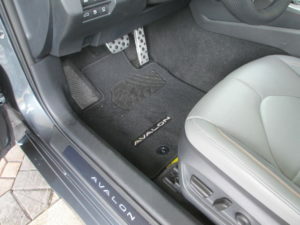 ), leg space (40.3 in. 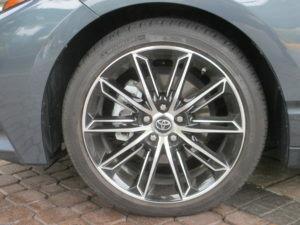 for V6; 40.4 in. 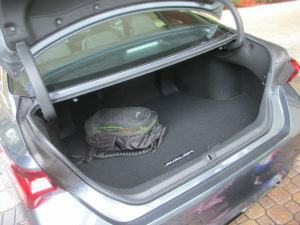 for HV), and headroom (37.5 in. for V6; 37.1 in. for HV). 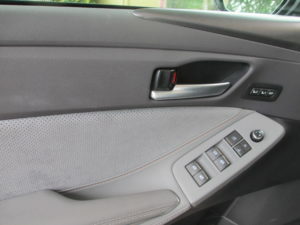 Material differentiation between grades is minimal; engineered wood trim is found on XLE, while Limited features real wood trim. Aluminum pieces adorn Touring’s and XSE’s cabins. A mix of Perforated Ultrasuede wraps all seating in Touring and XSE; Softex seats within XLE receive artistic vertical stitching. 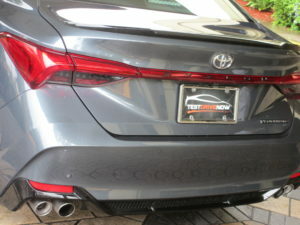 Limited goes beyond this creative approach by adding a special perforation and two-color stitches – both unique to Toyota – plus, a quilt pattern. 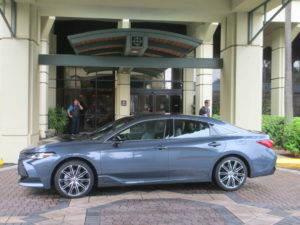 At the front seats, attentions are immediately fixated on Avalon’s slim center stack. 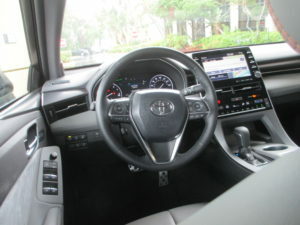 The thin panel houses Avalon’s 9-inch multimedia system (MMS) displaying audio and navigation, and integrates the automotive climate control system. Satin chrome-finish decoration surrounds the center cluster panel that “floats” above the instrument panel, further emphasizing the balanced aura of the modern atmosphere. 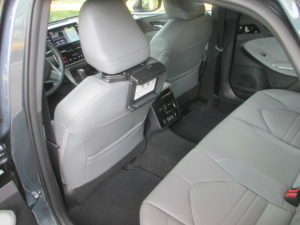 Below the panel, passengers have easy access to the slide-open eBin containing a 12-volt plug and the standard wireless Qi mobile device charger (available on XLE). 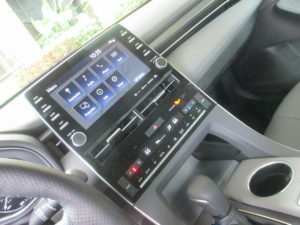 A trio of USB power ports (making for five total) is located inside the center console. 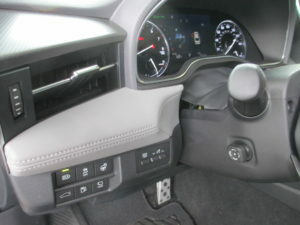 A part cup-holder, part phone cradle located atop the front console, sits adjacent to the gear selector; supple padding lines either side of the console’s lower tunnel at knee height. 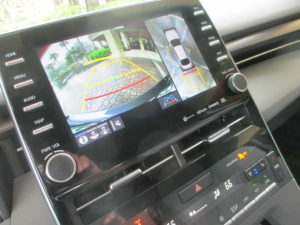 Past the steering wheel, a 7-inch Multi-Information Display (MID) shows vehicle information, turn-by-turn navigation, and various vehicle settings (including those pertaining to Lane Departure Alert with Steering Assist, Pre-Collision System with Pedestrian Detection, available Intelligent Clearance Sonar, Blind Spot Monitor with Rear Cross-Traffic Alert, and Head-Up Display). 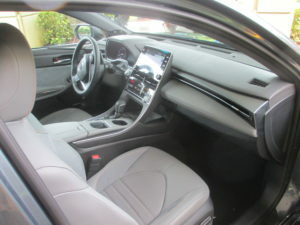 Two new menus can be accessed by drivers, including a digital speedometer and, in HV grades, a digital tachometer when its shifter is in “S” mode. On the MID’s left, there’s a tachometer with long bright white needles and updated typeface. 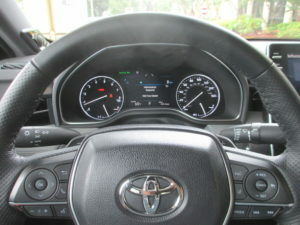 On its right, a speedometer. 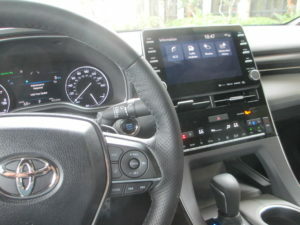 HV grades receive the same central 7-inch screen, but to its left sits a Hybrid System Indicator showing the vehicle’s regeneration status in CHG (charge), ECO (economy), or PWR (power) in real time. Save for XLE’s gauges, the tachometer/hybrid powertrain meter and speedometer on XSE, Limited, and Touring are surrounded by 3D Glow Rings. A chrome ring borders the entire meter cluster on all grades. 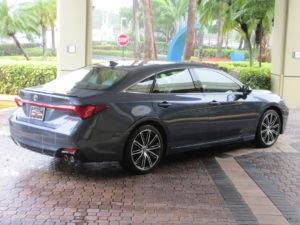 Hustle, athleticism, and fuel-efficiency. 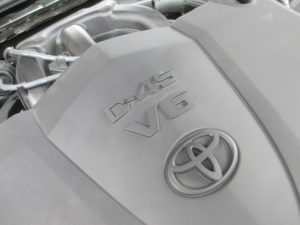 Each of these riveting traits has improved, in large part, because of two new TNGA powertrains: a punchy 301-horsepower, 267-lb.-ft. 3.5-liter V6 (2GR-FKS), and, a 215-net-horsepower 2.5-liter Dynamic Force four-cylinder Toyota Hybrid System II (THS II) with 650-volt electric motor (A25A-FXS) and Continuously-Variable Transmission (CVT). 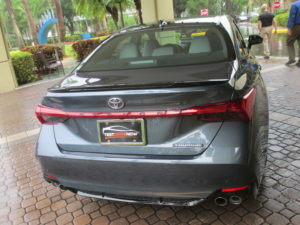 Avalon HV continues to be the only full hybrid vehicle in the segment. 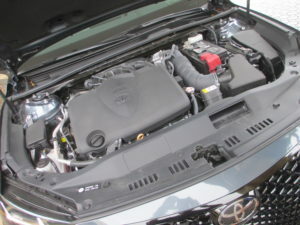 The four-cylinder Dynamic Force Engine is married to an all-new Toyota Hybrid System II powertrain that’s been engineered to inspire both spirited driving and fuel consciousness. 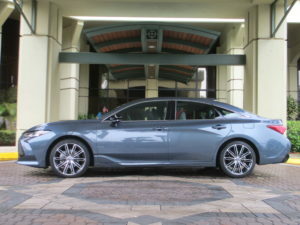 The hybrid system’s net power output is an impressive 215 horsepower – up 15 horsepower versus the outgoing version. 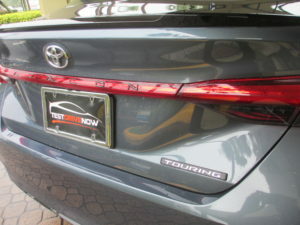 THS II uses two electric motors – MG1 and MG2 – to supplement the charging of the hybrid system’s Nickel-Metal Hydride (Ni-MH) battery pack, while MG2 assists the engine. 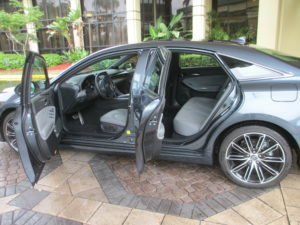 Adding more than a sprinkle of spark to Avalon HV’s sporty skillset is the inclusion of a new Sport drive mode and Sequential Shiftmatic technology. 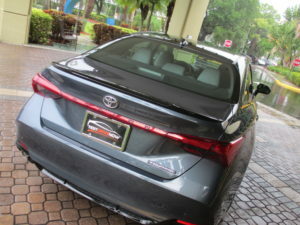 The Sport drive mode applies power from the hybrid system for improved acceleration and, as a bonus, all drive modes, including Sport, can each be used while EV mode is activated. With Shiftmatic technology, XSE drivers can “shift” through the Continuously-Variable Transmission’s six simulated gears via steering-wheel mounted paddles or the gearshift. 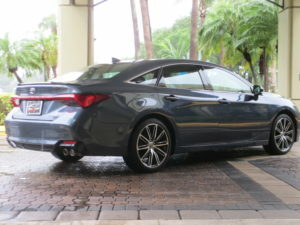 Although not equipped with AVS, XLE, Limited, and XSE take full advantage of their innately sporty platform and multi-link rear suspension and, to them, add thicker stabilizer bars and stiffer spring rates for maximum handling dexterity. 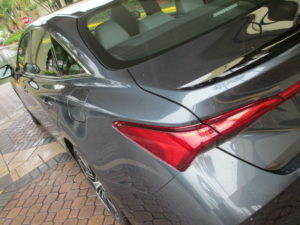 Spring stiffness, for example, is increased 25 percent when comparing XLE to Limited; stabilizer bar stiffness is up 20 percent and 86 percent, front and rear, respectively, when progressing from XLE to XSE.